Change the size to change the price! CouchGuard® leather paint is for finished / pigmented leather furniture and other leather surfaces like car interiors, handbags and shoes. It can be applied easily using the tools provided in our Complete Leather Repair Kits or with a mouth atomiser for minor repairs. If you have spray equipment at home then it can be applied this way too. Our leather colour range is flexible, has a built in sealer with excellent adhesion and rub fast properties meaning it won't come off onto your clothes. Our formula has the sealer built right in so no need for smelly solvent sealers after the colour has been applied and being waterbourne technology it can be posted. A button to a range of off the shelf colours is shown on this page. With so many retails all calling their leather colour range different names, your leather colour may not be listed here but don't worry theres bound to be a colour close to yours just a different name! Be sure to tap or click on the 'In The Box' tab to see a full detailed list of whats in each kit plus an Ideal for directly under the kit. Preparation is the key to good adhesion so Don't Forget to use the Leather Prep! Our Leather Colours come Satin-Gloss finish but we also do a Dulling Agent to lower the gloss level if needed. We have found you will need the Dulling Agent with the PL (Plush) Blacks. There are not enough words to thank you for the swift delivery on the leather dye I ordered. Less than five days from Victoria to Opotiki Bay of Plenty NZ. Absolutely great for the job of refurbishing military bronze plaques. Grateful thanks. I will be back! CouchGuard products are first class – I have been able to transform my tired looking lounge back to its showroom condition. I hardly used very much – it really is a great product !! The products are so easy to use and the Support Team is so helpful and knowledgeable . Truly 5 Star products and Staff !!! Q. What does the LB and PL stand for? A. LB is short for Lazy Boy and PL is short for Plush. Q. I have your samples and one colour is the same but called something different. Can I still use your colour? A. Certainly. It makes no difference what the colour is called, as long as it looks the same. Q. Can I use this product on vinyl? A. Yes you can use this on vinyl / bonded leather. Q. What does the leather paint end up feeling like after application? A. The product is specifically for leather. After its applied, your couch, recliner or car seat will still look, feel and smell like leather. Q. I want to recolour my 5 seater modular. 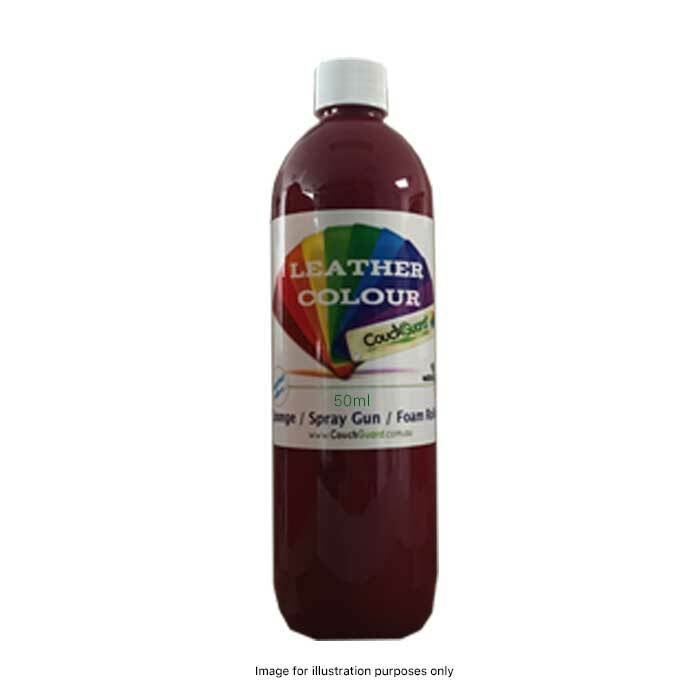 Would 500ml leather colour be enough? A. No. You would need 3 litres or the 3lt kit for a 5 seater modular, no chaise. You'll also find an "Ideal For..." under each kit listed in the "In The Box" tab. We can do an extra 1 litre at a discounted price if you are ordering a 3lt kit and your modular has a chaise or is extra large. Email us for info. Q. I have badly worn / cracked seating cushion. Can I use your products to repair and recolour this damage? A. Yes and No. Not all leather is repairable as such. Generally the seating areas along with the arm and headrest areas are damaged from body oils, perspiration etc. The leather has absorbed these contaminates over the years so getting a permeant repair is near impossible. Adhesion may / will be an issue or those areas will crack again with little use. If you do go ahead and repair badly damaged areas and the repairs fail, please don't blame our products when this happens. Q. How much does 50ml leather colour cover? A. It would cover the top of an arm on a couch. A 125ml will cover a complete bar stool or seating cushion. You'll also find an "Ideal For..." under each kit listed in the "In The Box" tab. Q. Can I have a colour made up? A. Yes you can. We would need a sample piece of leather no smaller then 100mm x 100mm, 1 liter quantites only plus a $50 mix and matching fee applies to all colour matching. Q. The 12 gram leather filler doesn't sound like much? A. No it doesn't but its light weight and goes a very long way. You only need little amount to fill a scratch or scuff. Q. If I use a coloured filler, do I still need to cover the repair with leather colour? A. Yes you sure do. The coloured flexible filler makes the leather colouring proccess quicker. Q. Can this filler and leather colour be used on car seats? A. Yes in can be used on car seats. Q. Can I the leather colour and filler be used on all leather types such as Aniline? A. Yes in can be BUT if you use it on Aniline Leather you then turn it into a Pigmented or Finished leather. You'd probably want to keep it to very minor scuffs or nicks. Complete Leather Repair kit 50 or 125ml cont. Coverage - Ideal for repairing scuffs, scratches, minor holes in couches & vehicle trim. Complete Leather Repair kit 500ml cont. Coverage - Ideal for repairing larger scuffs, scratches, minor holes in couches & front vehicle trim. Complete 1lt Leather Repair kit cont. Coverage - Ideal for 1 recliner, 4-6 dining room chairs or equivalent. Complete 2lt Leather Repair kit cont. Coverage - Ideal for recolouring 2 recliners, 3 seater or large vehicle trim. Complete 3lt Leather Re-colour kit cont. Coverage - Ideal for larger recolouring like a 2 plus 3 seater. Order these kits here from the Complete Leather Repair Kits. Simply read these easy to follow directions and your lounge will be like new again in no time at all! 3 Lightly sand the leather all over with 600g sand paper to etch the surface. 4 Spray the CouchGuard® Leather Prep onto the leather to be recoloured and wipe dry. The leather prep is not a leather cleaner and the leather must be recoloured after using. 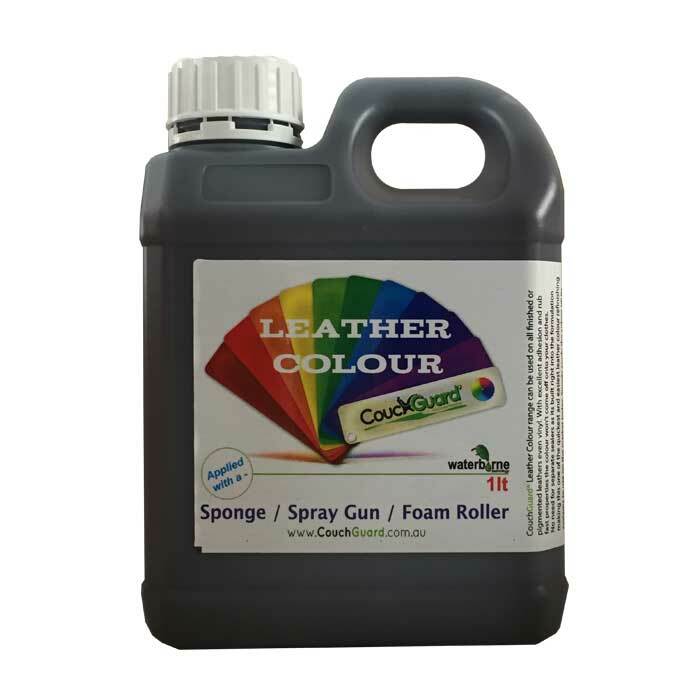 5 Shake the CouchGuard® Leather Colour well and poor an amount into the roller tray. Cover the foam roller with the leather colour, rolling out and excess colour and start to apply it to the leather surface. 6 Apply the colour in layers and don't apply too much at once. Work your way around the leather covering all the large areas 1st. 7 Once the main large areas are recoloured, generally 4-5 coats you then need to start on the fiddly hidden bits. This is best done the next day using the foam sponge and or foam brush supplied. 8 Hold the leather up and apply one coat of colour. Dry using a hairdryer and repeat until covered. Once dried with the hairdryer, place a piece of white cotton cloth between the 2 surfaces for a good 24 hours. This will stop the surface sticking together. 9 Sometimes you may find small amounts of dust or specs of dirt in the finish. Simply lightly sand the surface with 800g sand paper, reduce the leather colour with CouchGuard® Leather Reducer (10%) and apply 2 more coats. You are now done! 10 Clean up with water. You may also spray our leather colour on too if you have a compressor and spray gun. The colour will need to be reduced with CouchGuard® Leather Colour Reducer by no more then 10%. 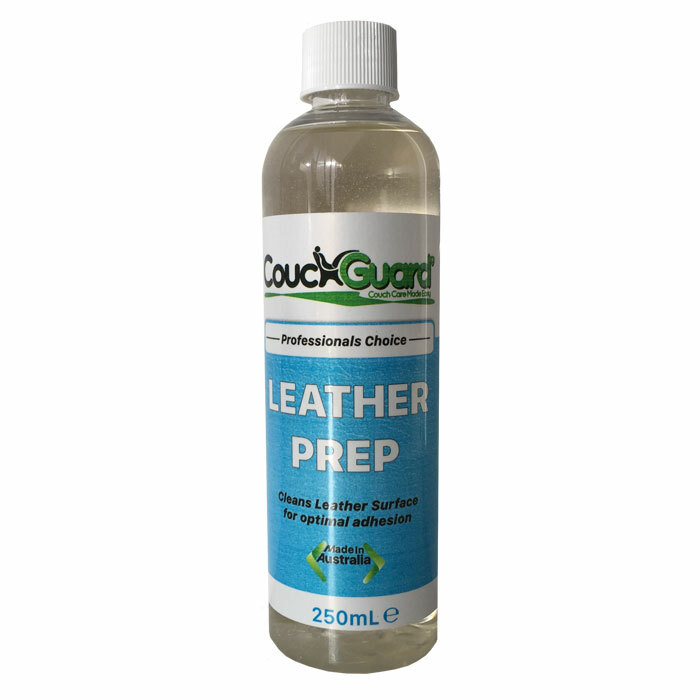 3 Spray the CouchGuard® Leather Prep onto the leather to be repaired and wipe dry. The leather prep is not a leather cleaner and the leather must be recoloured after using. 4 Lightly sand the repair area with 400 grit sand paper and 600g on the leather around around the repair. 5 Wipe away loose particals thoroughly. 6 Using the spatula provided, slowly build the flexible leather filler over the scratch. Allow to air dry. 7 If required, lightly sand with 600 grit sand paper followed by 800 grit sand paper. 8 Wipe area over with the damp biodegradable towel before appling CouchGuard® Leather Colour. 9 Clean up with water. Tip: You may use a hairdryer to help dye quicker. Tip: The Flexible filler is AIR DRY so keep the lid on tight when not using. 4 Using the spatula provided, slowly build the flexible leather filler over the scratch in coats. Allow each coat to air dry. 5 If required, lightly sand with 600 grit sand paper followed by 800 grit paper..
6 Wipe area over with the damp biodegradable towel before appling CouchGuard Leather Colour. 7 Clean up with water between coats (Spatula). Note: Filling a deeper scratch completely with flexible leather filler all at once will just take the repair longer to dry before sanding can occur Sometimes days! 6 Cut the heat activated backing paper larger then the cut or hole and place (glue side up) on the underside of the leather using the tweezers. Once in position, apply small beed of CouchGuard® Leather Glue to one side of the cut and press down firmly. Now repeat on the other side. You can use a hairdryer to heat the area, activating the glue and press down firmly. Clean ups any excess glue with water. 7 Using the spatula provided, slowly build the flexible leather filler over the cut or hole in layers. Allow to air dry. You may also cut a small leather patch from the swatch in the Complete Leather Repair Kit and glue this to the backing fabric in the hole to use less filler and make for a quicker and better looking repair. 8 If required, lightly sand with 600 grit sand paper followed by 800 grit sand paper. 9 Wipe area over with the damp biodegradable towel before appling CouchGuard Leather Colour. 10 Clean up with water (Spatula).